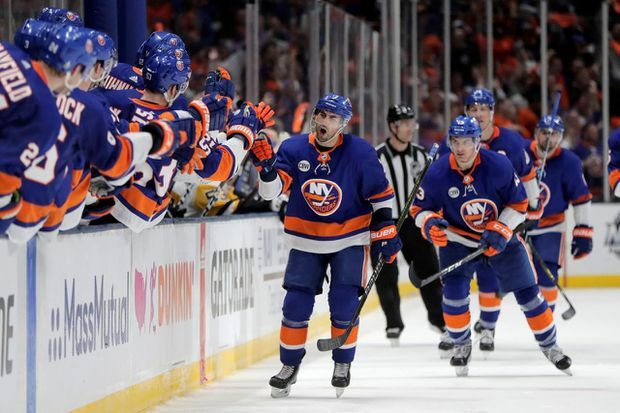 New York Islanders right wing Jordan Eberle celebrates his third-period goal against the Pittsburgh Penguins on April 12, 2019. The Islanders won 3-1 to take a 2-0 series lead. Murray has lost consecutive playoff games for the fourth time. He also did it in Games 3 and 4 of 2017 Stanley Cup Final against Nashville, and Games 2-3 and 5-6 against Washington in second round last year. ... Penguins F Jared McCann sat out due to an upper-body injury. He was replaced in the lineup by F Teddy Blueger, making his playoff debut. D Jack Johnson was back in the lineup after sitting out Game 1. He had played in all 82 games during the regular season. D Olli Maatta sat out to make room. ... New York was 38-2-2 in regular season when scoring at least 3 goals, and is now 2-0 in playoffs.